Time is a tricky thing. It can be used poorly or well, lays waste some objects but improves others and is, in general, considered in short supply by anyone not stranded on a desert island. In the realm of manufacturing, Time is an element that can be as valuable to a manufacturer’s bottom line as cost and price. It can literally make or break a product launch, chew up a supply chain or help cement a business deal all in a day. Thanks to the lean revolution that took American manufacturing by storm a few decades ago, Time has been soundly brought to heel along the actual touch points of machining. The result has been a remarkable uptick in productivity that’s still continuing. On the factory floor at least, Time has been sliced and diced and made to do our bidding. Of course, manufacturing involves a lot more than machining. From vetting suppliers and materials processing to managing supply chains that stretch through swamps and around embargoes, a lot of what passes as the work of manufacturing is just waiting — on people, materials, logistics, problems and more. How is it that, aside from the factory floor, Time in manufacturing is allowed such leeway? The goldurned RFQ, that’s why. Request for quote procedures and processes have been around for aeons. The first time one Neanderthal grunted to another about how many saber tooth tiger pelts would land him an ax head, the RFQ was born. It’s since become a standard of pricing and negotiation within dozens of industries. But just because something is a standard doesn’t mean it’s an idea for the ages, and in an age like ours, where customers are obsessed with speed, NOW and instant everything, that’s especially true of the RFQ. 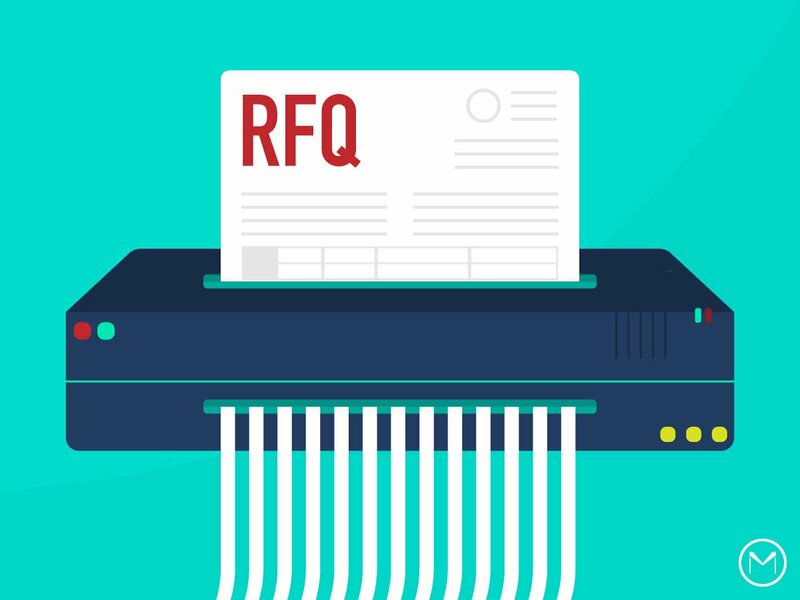 When manufacturers send RFQs out, they enter a limbo of waiting — for days, weeks, even a month or more for suppliers to send it back. Once the RFQs roll in, the range of prices — not to mention the range of qualities they represent — is often so vast that the point of gathering quotes in the first place is rendered almost meaningless. Suppliers are no better off. Every RFQ is an attempt on the part of the manufacturer to suss out the lowest price via a game of Blind Man’s Bluff where every shop involved is always blind and always It. Many RFQs require test parts involving real expenditures of machining time, personnel and resources, and if the price quoted isn’t the lowest, all a supplier has to show for running a great batch of quality test parts is a pile of unpaid-for metal. It’s time to kill the RFQ. It routinely fails both suppliers and manufacturers, and it’s also no longer necessary. In the Digital Age, arriving at true pricing and costing is possible, because for the first time in the history of Planet Earth, data is accessible, online, massive and constantly being generated. It’s a seachange, yes, and will take some getting used to. Here at MakeTime, we’ve killed the RFQ and replaced it with a pricing model that’s data-driven, transparent and drawing ever closer to instant. Get your time back from the RFQ. You’ll be able to bring products to market faster and more often, innovate more reliably and restore trust in manufacturing instead of continuing to wear it down, highballing and lowballing the people with whom you do business. Like lighting lamps with whale oil, the RFQ’s time has passed. It’s time to embrace an approach to manufacturing that won’t squander a single, precious second. Find out how MakeTime can save you time here.